If you read the first part of my search for the artisans of Chiapas you know we visited Amatenango del Valle where we found the artisans who mould the clay into wonderful animal figures, in particular the sacred jaguars. 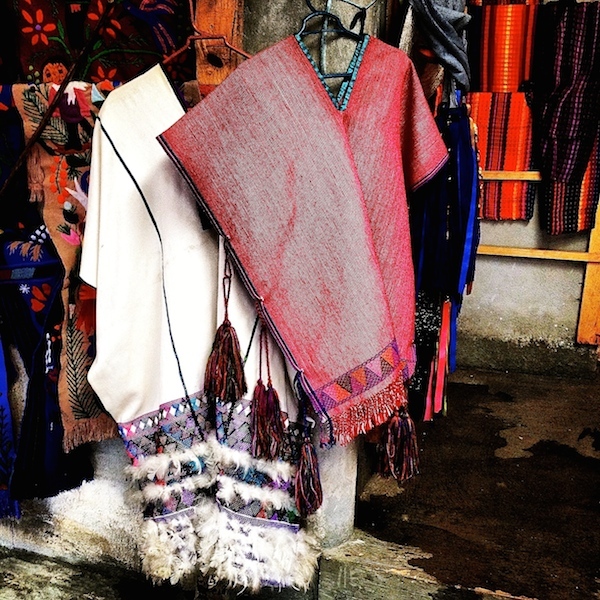 From the valley of Amatenango we decided to go to the highlands in search of the weavers and embroiders of Zinacantan. 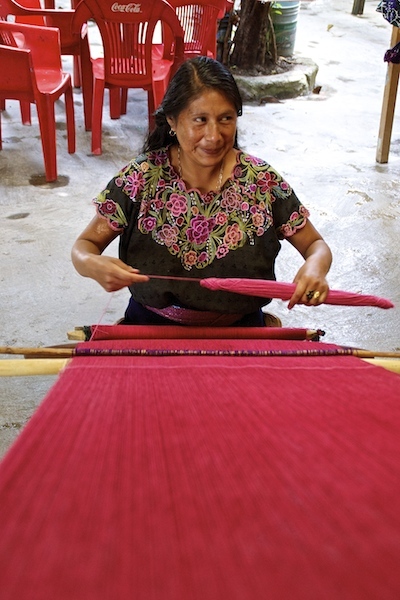 Zinacantan is a pueblo that produces flowers but is known for the talented women who create from their homes the most beautiful and intricate designs in carpets, tablecloths, shawls and other pieces. 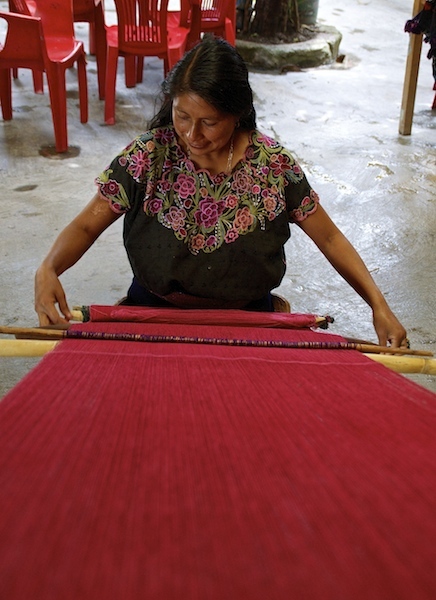 Their weaving and embroidery skills are famous and a visit is strongly recommended when you visit Chiapas. 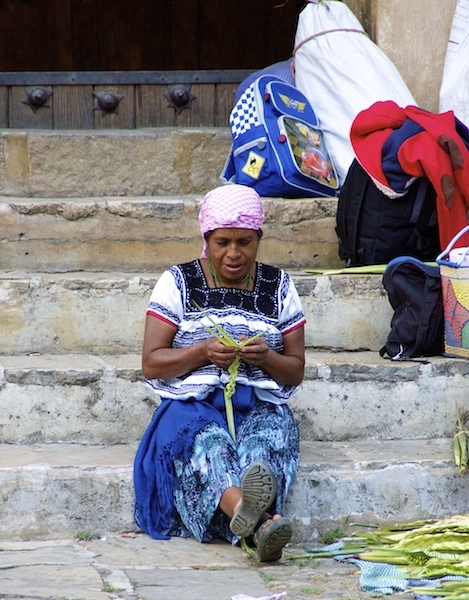 There are no shops in Zinacantan, when you get to the pueblo, girls and women are there to welcome you and invite you to their house. You can choose which invitation to accept and then you will be shown the way. When they see your car, the house comes to life. They rush to welcome you and show you their workshop. The family we visited has six children and we were taken to their house by one of the daughters. 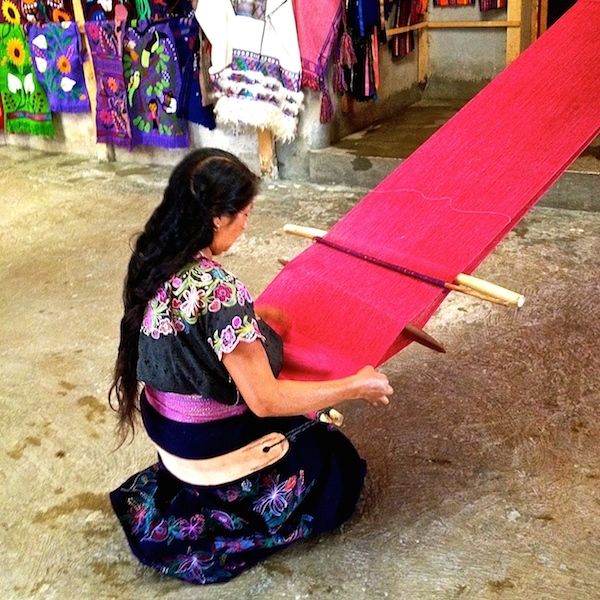 Rosita, the mother, demonstrated how they weave with a waist loom. She learned her craft from her grandmother and is already teaching her daughters. She told me in two months anybody should be able to master the basics although mastery will take a year or two. Eight women of her extended family have combined their work to offer to visitors, including her sisters and sisters in law. The time spent with a piece depends on the size and how intricate the design is. 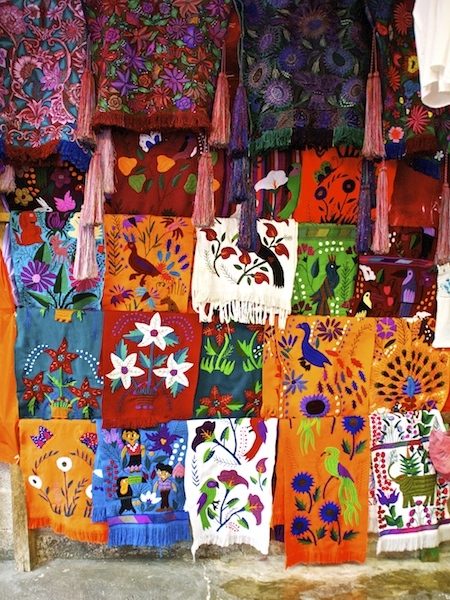 A tablecloth for example can take up to three weeks. There is no mass production here, so every piece and its design is unique. Rosita also showed me a bridal and groom outfits that you can see here. Part of the experience and after choosing a few special pieces to take home, is to pass to the traditional kitchen where delicious quesadillas made with fresh cheese and handmade tortillas will be prepared for you. 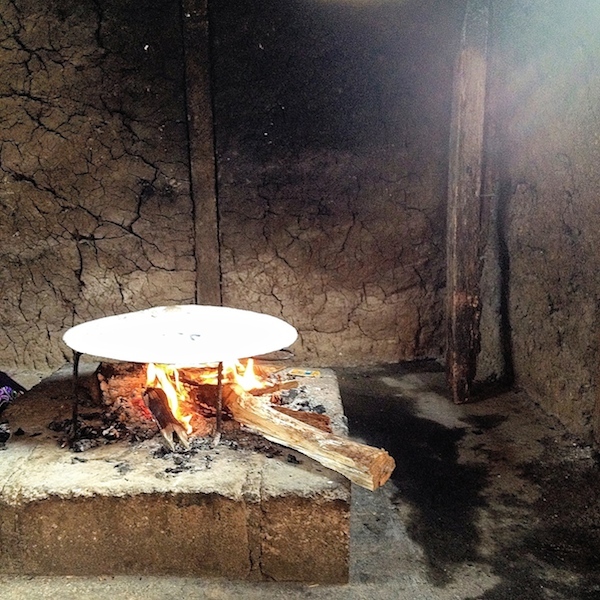 Sharing these moments with another family of traditional artisans, eating their food, is a great experience, one we always embark without any fears. I’m very grateful for these moments, this is the kind of experience that will always be part of my good memories of Mexico. 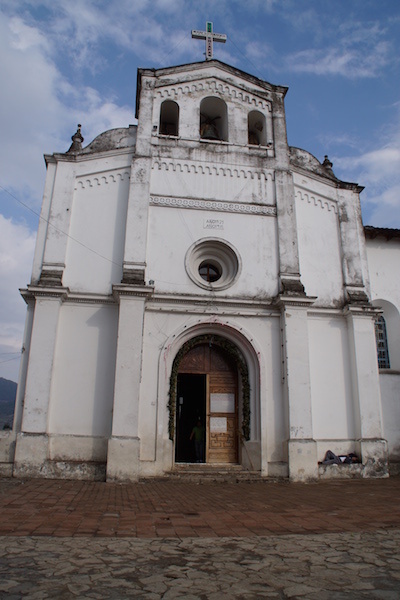 When we left the house we asked to visit the San Lorenzo church. You are allowed to take photos from outside but never from inside. The reason for this is that in Zinacantan Catholic faith is mixed with certain pre-hispanic traditions that are performed inside the church. It is fascinating to watch. It was Easter week and when we entered we saw a group of men all dressed in white tunics and shorts, wearing sandals. It was like you were entering a time capsule, it looked very pre-hispanic mixed with some recognizable Catholic signs. All the saints were completely covered in purple, you couldn’t see their faces or bodies. 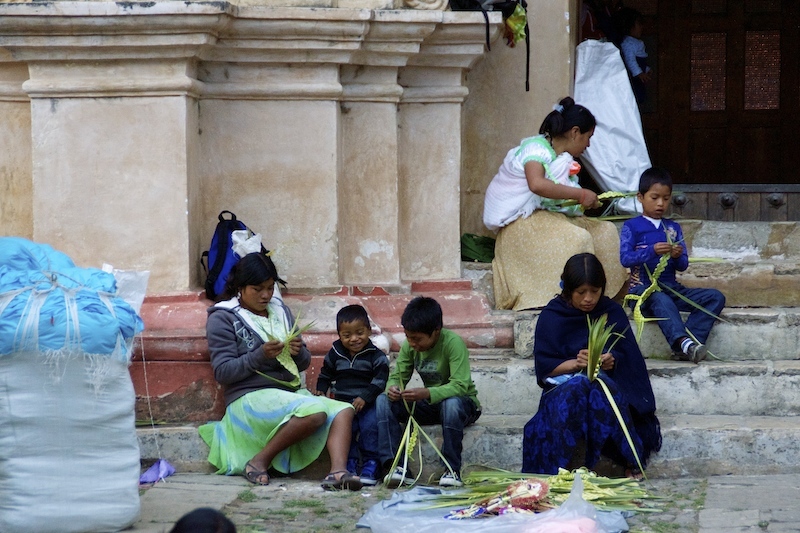 Several churches in Mexico do that during Easter as a sign of mourning for the death of Jesus. Then there were other saints laying down, flowers were being cut and put around them and certain rituals performed. There was also a great amount of incense in the air. 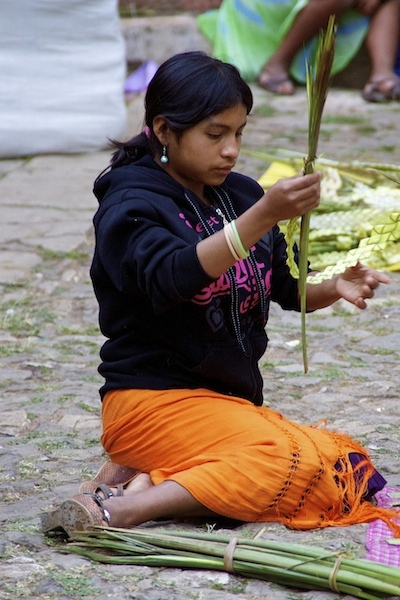 Rosita’s daughter told us they were preparing them for a Easter procession the next day. We just sat there and respectfully observed. It was a special moment. 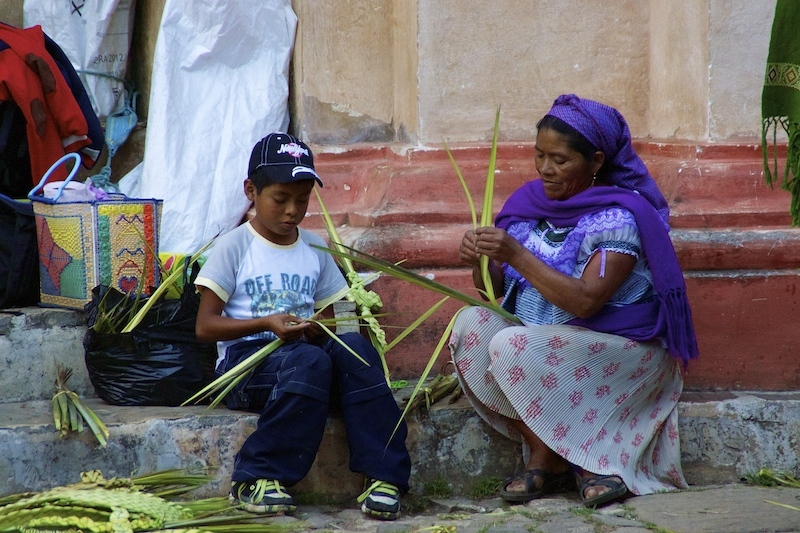 I leave you with another type of artisans, the market and street type who also keep family traditions alive and during holy week make these special crosses in beautiful patterns for Palm sunday.